Here are the notes I wrote on the board today about your final research paper. Please remember that it’s due next Tuesday, November 30th. I’m looking forward to reading your papers! Today we discussed documentation of processes or products, and you demonstrated the documentation sources you found for your homework. We also discussed your research paper draft, and some issues that appeared frequently in your drafts. More details are available in today’s slides. Also, here’s the formatting example for your final research paper that I handed out in class today. 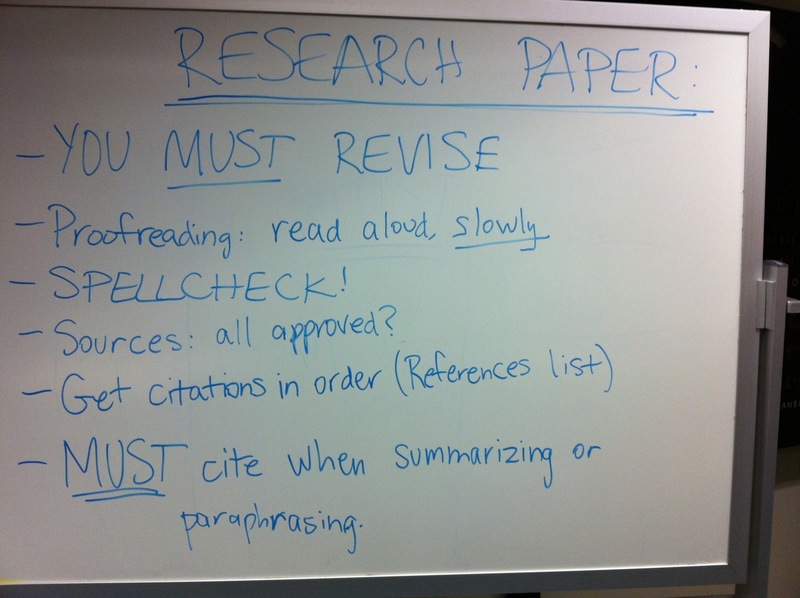 There’s no reading or homework this weekend other than revising your paper. Your final paper is due on November 30th! Detailed guidelines are available on the Assignments page. Article from the New York Times earlier this year on the decision by Google to shutter its Chinese site and redirect users to the Hong Kong version for Chinese-language searching. What are your thoughts on this, especially given what we read in the Grimmelmann article about Google’s history of censorship of its Chinese site? Here’s an example of a news story that has captured the popular consciousness despite being untrue, an example of the power of media hype (which Fister discusses). Sometimes the peer review process fails — this article from The Guardian (a British newspaper) describes a computer-generated article that was accepted for publication in a scholarly journal. Blog post about the revelation that scholarly publishing company Elsevier had created a fake publication that appeared to be a peer-reviewed journal but was in reality a collection of articles favorably reviewing drugs from the pharmacy company Merck.